Not all putts of the same length are equal! The proximity a ball finishes to the hole and strokes gained putting are two common statistics measured on the PGA Tour. Strokes Gained Putting quantifies a golfer’s putting performance relative to the field, taking into account the initial distance of each putt. Therefore, holing a 10ft putt scores higher than holing a 5ft putt. However, how many times do you hear a commentator say, “They have left themselves a tricky putt here?” When faced with certain putts during a round of golf, why do some putts feel easier than others, even though the putt may be longer? I can find an 8ft putt that most players of a single figure handicap would be disappointed if they missed and yet I can find another 8ft putt that the chance of even the best players in the world holing is 10% at best – why is this? Proximity to hole is certainly a contributing factor for success rate, however, the following drill I have designed is to highlight that this is not always the case. I have called it the ‘Snowman Drill’ – hopefully, once you have completed the drill the name will be self explanatory! 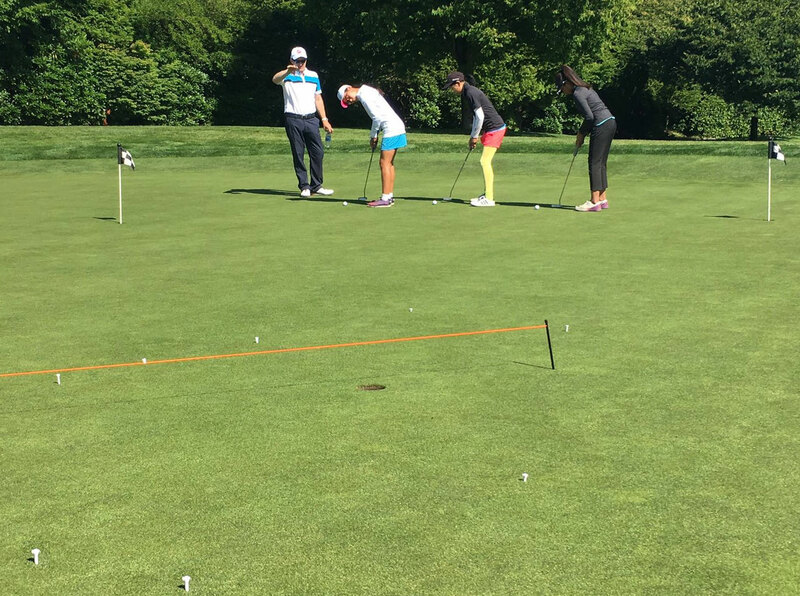 The drill will highlight your strengths and weaknesses on the putting green. Find a uniform slope (or as close as possible) on the putting green (between 2 and 3% being ideal). Spend a couple of minutes to find the true down slope (12 o’clock) and the true upslope (6 o’clock). This is a skill in itself and one I very much encourage a player to learn. It can save a lot of heartache in the future! If you have a PH String Line then it is always a good idea to run the string up and down the fall line. (Please remember if you can’t find a uniform slope, the true upslope and true down slope might not necessarily be the same, so you may need to slightly offset your clock face). You can always use a PH Ghost Hole if it makes it easier to find a uniform slope. Snowman Drill, I would advise starting from 1 o’clock and then moving to 3, 5, 7 ,9, 11, and then round again starting from 2, 4, 6, 8, 10 and 12 o’clock. What distance did you manage to hole 2 consecutive putts from each of the positions on the clock face? Once you have completed the task and filled in the table, join the dots together on the chart. Do you see a pattern or picture developing? 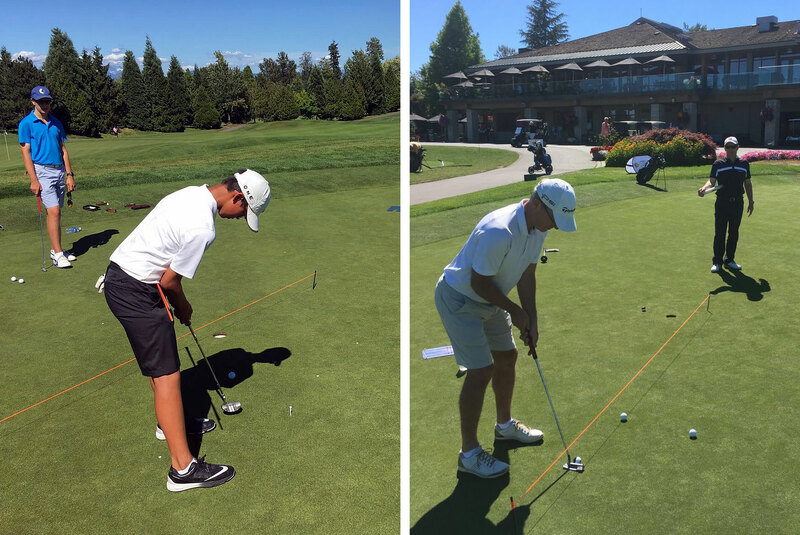 Do you hole more putts right-to-left or left-to-right? 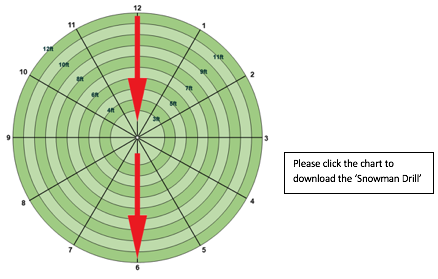 Which position on the clock face gives you the largest distance for conversion of the putts? Which position on the clock face gives you the shortest distance for conversion of the putts? This drill is a way to identify your strengths and weaknesses along with identifying your safe zone! If your ball finishes inside your safe zone, you should be very confident in holing the putt, and you have the right to be upset with yourself for missing the putt. If you had a putt of 6 feet, where would you prefer the putt to be to maximise your chances of success? 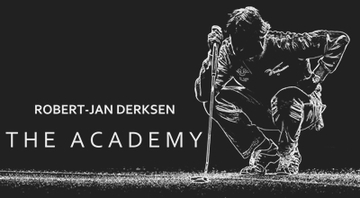 Please see the two completed drills from a PGA European Tour Player and one from a 7 handicap male golfer. What are their strengths and weakness? Which position on the clock face gives the player the largest and shortest distance for conversion of the putts? 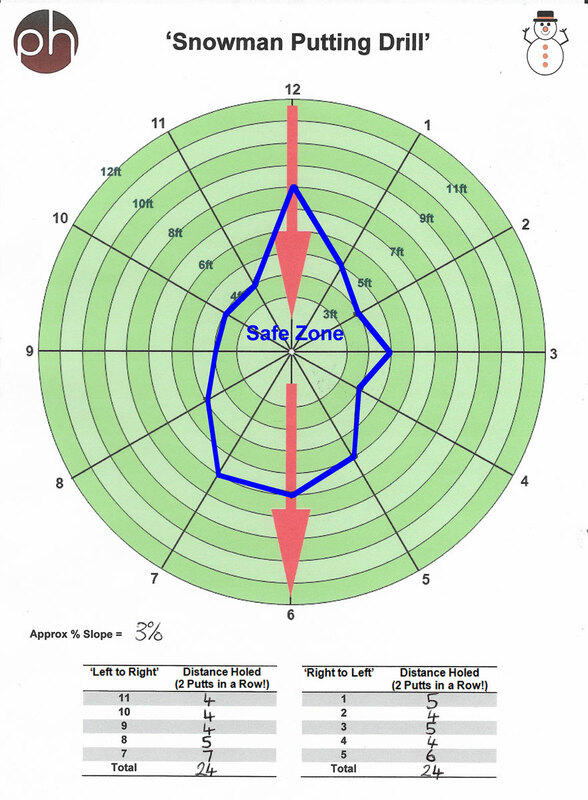 Compare the size of their safe zones’. Next time you are playing your bunker shot or chip from a poor lie, work out where your true down slope is (6 or 12 o’clock), where your safe zone is and try and ensure your ball finishes inside it. If that means playing slightly away from the flag then so be it. There is nothing worse than playing a good bunker shot to 6ft (the crowd give you a clap), only to be left with a putt outside your safe zone! Of course you can still hole this putt, but it is a significantly harder putt than one of the same 6ft length that is inside your safe zone! Why? Because, you have completed the snowman drill and know your own strengths and weaknesses. There will obviously be the occasions during match play events when a chip in is required to make the cut, or even a holed bunker shot is the only way to force a play-off. Your strategy will be more aggressive as a result, but golf is predominately played over a medal format (over four days) when playing the percentages (playing to your safe zone) is often required to ensure you shoot the lowest score possible. There is a time and a place to be aggressive, for me understanding your strengths and weaknesses are crucial to success. Typically clock face positions 2 and 10 are the hardest, because you have a smaller margin for error with ball speed in these starting positions. Ball speed is not only influenced by clubhead speed at impact, but also clubhead acceleration during impact, impact location, ball launch angle, ball spin and, ultimately, the point of true roll. As a result you can’t chose the line you want to hit your putt on until you have decided on the speed you wish to hit the putt. Speed determines the line, the point of true roll and, ultimately, how a golf ball slows down determines where the ball will take the break of the slope. A number of playing professionals have completed this drill and nobody has a uniform distance over all twelve clock face locations! In fact some vary in distance by over 5ft, highlighting to the player that indeed, not all putts of the same length are equal. I would encourage any aspiring golfer, to understand their strengths and weaknesses and ultimately what their safe zone is by trying the Snowman Drill. 1) Find the straight putt, both uphill and downhill. 2) Play the simplest possible shot to leave yourself inside your safe zone allowing you the easiest putt. 3) Turn three putts into two putts by playing the percentages to leave yourself inside your safe zone. 4) Increase your up and down percentages by playing sensibly and ensuring your approach shot finishes in your safe zone. 5) Make more birdies from 100 yards and in, giving yourself the easier birdie putt inside your safe zone, despite being further away, you will have a higher chance of success. 6) If you are a playing professional, I would ask you to complete the drill using three balls! You must hole three consecutive putts for each clock face position. 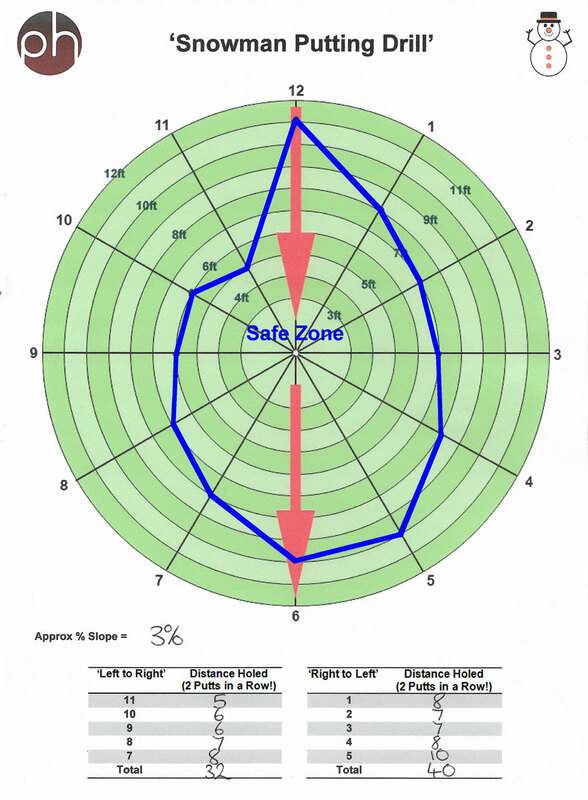 How does the safe zone compare to two balls? completed Snowman Drill Chart. I would be most grateful for your data.